Fixed mortgage rates resumed their decline, aiding homebuyer affordability amid a tight supply of for-sale homes in many markets, according to the recently released Freddie Mac Primary Mortgage Market Survey® (PMMS®). Survey results show the 30-year fixed-rate mortgage (FRM) averaged 3.62 percent with an average 0.6 point for the week ending February 25, 2016, down from last week when it averaged 3.65 percent. A year ago at this time, the 30-year FRM averaged 3.80 percent. The 15-year FRM this week averaged 2.93 percent with an average 0.5 point, down from last week when it averaged 2.95 percent. A year ago at this time, the 15-year FRM averaged 3.07 percent. The 5-year Treasury-indexed hybrid adjustable-rate mortgage (ARM) averaged 2.79 percent this week with an average 0.5 point, down from last week when it averaged 2.85 percent. A year ago, the 5-year ARM averaged 2.99 percent. "Yields on the 10-year Treasury continued their downward trend this week after a small rally the previous two weeks,” says Sean Becketti, chief economist, Freddie Mac. “The 30-year mortgage responded, falling 3 basis points to 3.62 percent. Since the beginning of 2016, 30-year rates have fallen almost 40 basis points helping housing markets sustain their momentum into this year. Earlier this week, the National Association of Realtors announced existing home-sales were up 4 percent month-over-month in January and up 11 percent from last year." 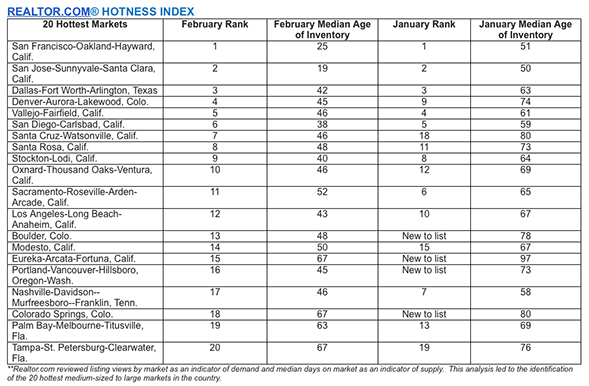 California dominates the list again this month with eight of the top 10 markets, while Florida, Texas and Colorado feature multiple markets. 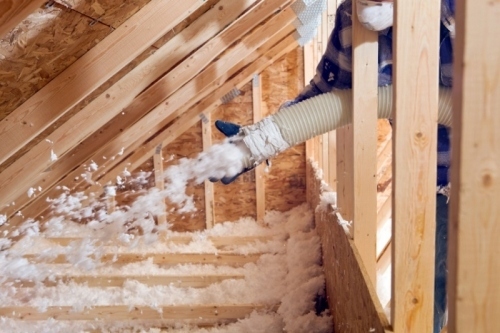 Did you make your home more energy-efficient last year? You may be eligible for tax credits when you file your return, according to home energy evaluator Homeselfe. Jain explains that there are two types of major tax credits available to homeowners: the Residential Energy Efficient Property Tax Credit, which benefits those who have incorporated renewable energy features into their home, and the Nonbusiness Energy Property Tax Credit, which benefits those who have installed materials that meet the U.S. Department of Energy’s energy efficiency standards. Homeowners who have invested in energy-efficient upgrades, such as fuel cells, geothermal heat pumps, small wind turbines, solar panels and solar-powered water heaters, may be eligible for the first credit. Homeowners who have invested in energy-efficient improvements like insulated roofing, windows and doors may be eligible for the latter. Tax credits up to $500 are also available for some improvements, such as installing advanced, main air-circulating fans, a biomass stove, an energy-efficient HVAC system or water heater, insulation, or metal or asphalt roofing. Mortgage rates moved lower for the fifth consecutive week amid ongoing market volatility, according to a recently released Freddie Mac Primary Mortgage Market Survey® (PMMS®). The average 30-year fixed is at its lowest point since the week of April 30, 2015 when it averaged 3.68 percent. The 30-year fixed-rate mortgage (FRM) averaged 3.72 percent with an average 0.6 point for the week ending February 4, 2016, down from last week when it averaged 3.79 percent. A year ago at this time, the 30-year FRM averaged 3.59 percent. The 15-year FRM this week averaged 3.01 percent with an average 0.5 point, down from 3.07 percent last week. A year ago at this time, the 15-year FRM averaged 2.92 percent. Additionally, the 5-year Treasury-indexed hybrid adjustable-rate mortgage (ARM) averaged 2.85 percent this week with an average 0.4 point, down from last week when it averaged 2.90 percent. A year ago, the 5-year ARM averaged 2.82 percent. "Market volatility—and the associated flight to quality—continued unabated this week. The yield on the 10-year Treasury dropped another 15 basis points, and the 30-year mortgage rate fell 7 basis points as well, to 3.72 percent,” says Sean Becketti, chief economist, Freddie Mac. Both the Treasury yield and the mortgage rate now are in the neighborhood of early-2015 lows. These declines are not what the market anticipated when the Fed raised the Federal funds rate in December. For now, though, sub-4-percent mortgage rates are providing a longer-than-expected opportunity for mortgage borrowers to refinance." Q: Should I Sell My Home First or Wait until I Have Bought another Home? A: This is a tough decision, but the answer will depend on your personal situation, as well as the condition of the local housing market.